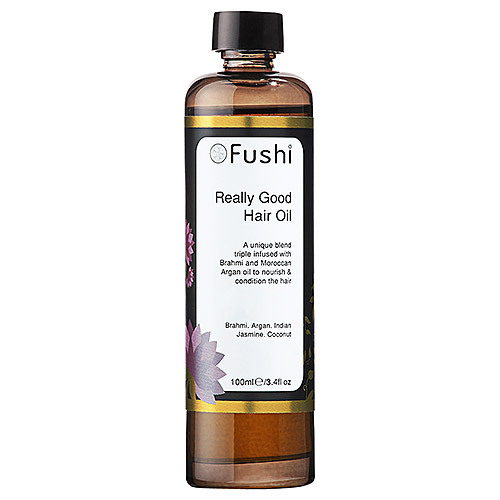 The Really Good Hair Oil is a superb combination of the very best oils to ensure your hair is left beautifully conditioned, healthier and stronger. It has been formulated with an effective and nutritive blend of five nourishing and rejuvenating oils. Moroccan, argan and virgin coconut oils, well known for their hair strengthening and smoothing properties, have been blended with vitamin E rich avocado oil and sweet almond oil to replenish and restore shine and moisture. Added to this blend are the potent Ayurvedic triple infused herbs brahmi and neem. Brahmi is rich in antioxidants and helps with hair growth and hair discolouration. Brahmi is able to nourish the hair roots and promote healthier growth while Neem will promote a healthier scalp and is extremely beneficial for thinning hair. Fragranced with gorgeous Indian Jasmine essential oil. Organic Sesame Seed Oil (Sesamum Indicum), Triple infused Organic Brahmi Serum (Brahmi Herpestis), Organic Coconut Oil (Cocos nucifera), Organic Avocado Oil (Persea americana), Organic Sweet Almond Oil (Prunus dulcis), Organic Moroccan Argan Oil (Argania spinosa), Neem (Azadirachta Indica), Indian Jasmine Absolute EO (Jasminum grandiflorum), Vitamin E (Tocopheryl Acetate). Massage the hair oil gently into your scalp and leave overnight, allowing it to seep into the scalp and nourish your hair from the roots. Wash out thoroughly the next morning. For quick intensive conditioning, massage the hair oil into your scalp and wrap your hair with a steaming towel for at least half an hour and then wash out thoroughly. 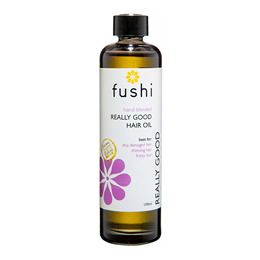 Below are reviews of Fushi Really Good Hair Oil - 100ml by bodykind customers. If you have tried this product we'd love to hear what you think so please leave a review. This really is an exceptional product, I was given a sample some time ago and finally got around to buying. It may look expensive, but a little goes a long way and your hair/scalp will love you for using it. Simply massage into dry hair/comb through and leave overnight, works wonders and smells divine.